Since I’ve started my new job (now 8 months old), one of the things that I’ve written about most often is the need for me to have time discipline. It seemed as if I spent each day running from deadline to deadline. Finally, after all this time, I’ve started to develop a rhythm to my life during the work week. Somehow, I’ve found a way to get through each day feeling less pressured, less rushed. Some of this feeling may be that I’ve made my first set of deadlines and created a successful product within those constraints. But, another part of it is that I’ve loosened up some as I go through my day. I’m more consciously taking time for me, running errands, reading a good book or just sitting and thinking during my lunch break. Before, I’d try to get in early, hoping that I could leave early, and usually not getting out until late. So, I was shorting myself at both ends of the day, and in the middle. I felt cheated, hassled and out of control. I lucked into the idea that if I found a way to make my work day more relaxed, less time constrained, I’d feel better all the way around. On my own, I slowed down. Spent more time taking deep breaths and finding small ways to be of service and feel part of the team. Imagine my surprise when I realized that in slowing down, I was implementing the practice of the rest step. A technique used by mountain climbers, the rest step is a pacing tool. The idea is for the climber to pick the pace that allows them to move comfortably and consistently through their journey up the hill or mountain. 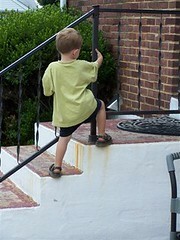 When using the rest step, the climber maintains a pace that is comfortable for the entire journey. The rest step is the pace at which the climber can keep moving without becoming breathless and physically stressed. Like aerobic activity, the measure of the correct pace is the ability to walk and talk at the same time. The purpose of the rest step is to allow us to move with purpose. When we move at a pace which doesn’t stress us while still making progress toward our goal, we have time to observe. We can watch where we step and perhaps avoid a sprained ankle or worse. We can think about the journey. We can plan ahead. By moving at our own natural pace, we make the best use of our personal resources, conserving energy for future needs. The rest step is the exact opposite of what I was doing at work. I was rushing from task to task. I was pushing hard throughout the whole day. I wasn’t taking breaks and I was wasting energy trying to “save” time so that things would be better and I was actually making them worse. I discovered the rest step, without knowing what it was, because I didn’t like the way my days and weeks felt. I chose to slow down because I was tired of going everywhere so darn fast. Then, I discovered that I had created an age old practice. Amazing! Through all the years that we humans have been rushing around, there were wise ones who knew that the best way was to slow down. And so, after many, many years, I’ve figured it out. Slow down. Pay attention. Watch where you step (you never know where the dog has been). Appreciate the journey and you just may accomplish much while enjoying the effort. Slowing down changes your perspective, it increases your stamina and gives you time to adjust your course. Try the rest step and see what you lose – hurry, stress, missteps and redos. I think you’ll find it’s well worth it.